Launchpad couldn't import bug #90047 from freedesktop.org Bugzilla. What happens: After running for a few minutes the graphics gets flacky. What should happen: Graphics should not get flaky. I have just installed ubuntu 14.04 on my new thinkpad t450s. Everything basically works, but something is very flaky about my keyboard or display or both. After running for awhile some apps (E.g., thunderbird and sometimes emacs for example) will display garbage. If I refresh by moving the screen around or changing buffers/tabs/etc. they can often recover. I see that there is an [Intel(R) Graphics Installer for Linux* 1.0.7](https://01.org/linuxgraphics/downloads/2014/intelr-graphics-installer-linux-1.0.7). I am leery about just loading this and running it. Any suggestions about how I should proceed? Hello, can you attach the screenshot when this happens? Here are a few screen shots of portions of the screen that show the kinds of corruption that are happening. I have a NUC5i3RYH with a very similar issue. Same kernel/driver. 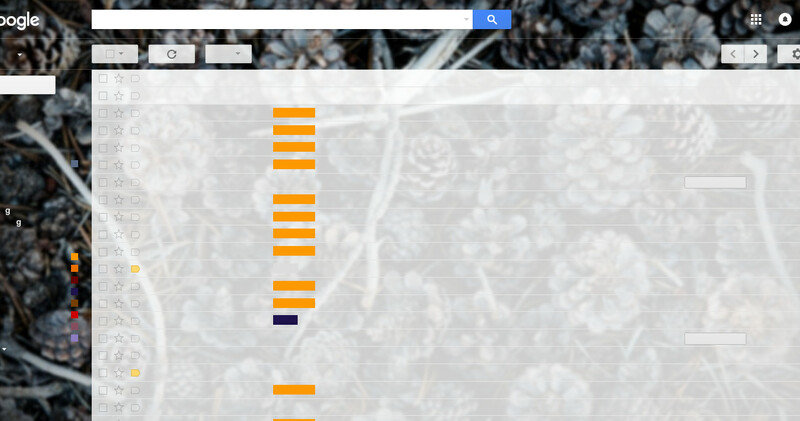 I get the "missing (corrupt) letters" only, but no "black blobs". Particularly, this is an issue after resume from suspend. Regular usage is stable fresh from boot, so I do not get it as bad as Po-Hsu Lin. Seems certain font sets get corrupted but once corrupted, are stuck. E.g. 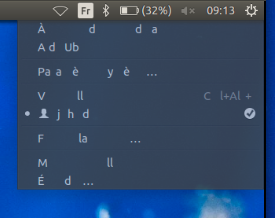 switching font size in terminal shows this. 11 pt broken, 12 point fine (until next suspend). Maybe if I do enough stuff (moving/resizing windows) the corruption moves. See attached - note the "V" of "VGA compatible controller" near the bottom is mangled. This is typical. Corruption can occur within any app/title bar etc. Is this any better on 15.04? Happy to help out testing fixes. Often this is accompanied by Xorg consuming more than 50% of the cpu cycles. Once it gets into that state the only thing I can do is log out and log back in. Help! One more thing. Enclosed is another screen shot. I have also tried 14.10 and similar issues happen there. 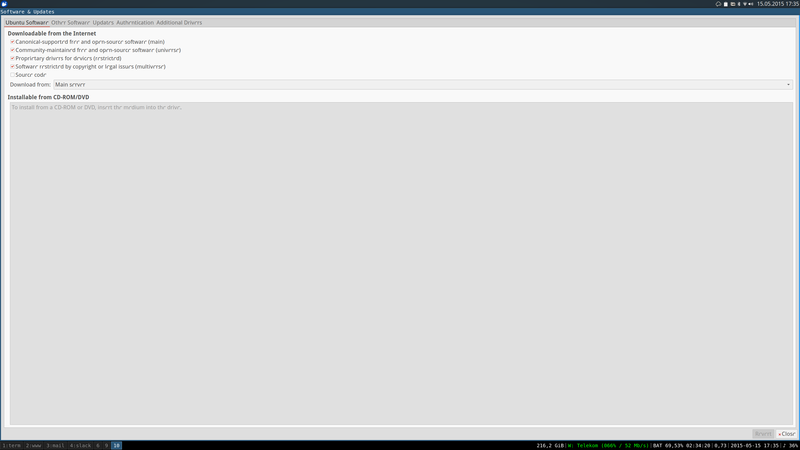 This is not a solution, but under kubuntu things work pretty well. Maybe this has something to do with the different window managers. I would really like to go back to unity and ubuntu. I hope someone looks into this. I am also seeing this on a fresh 14.04 install on a T450s. So far I'm only seeing the missing letters. So far have only seen it on the external 2550x1400 monitor, and not the native laptop screen.... but I don't have a lot of hours in yet, and it happened fairly quickly on the external monitor. Hello same problem here on Dell Latitude E7450 with kernel 3.16.0-33 and with xserver-xorg-video-intel-lts-utopic stack on Ubuntu 14.04.2 LTS. Mostly black rectangles and missing letters, for example in folder's name on the Desktop. This occurs after some time after having boot and probably when resuming from sleep. I Will try to provide screenshot next time it happens. To resume to a normal situation, I have to logout & logon, but it doesn't work each time. I forgot to say the bug occurs this time just after having boot (not from resume). I am affected by this bug as well. T450s running Ubuntu 14.10 on kernel 3.16.0-33-generic #44-Ubuntu SMP Thu Mar 12 12:19:35 UTC 2015. Attached are is a screenshot of the error (one taken with an actual camera because Ubuntu won't let you snap a screenshot while you have a right-click context menu open). The system has been like this since boot, and the missing letters manifest themselves in different ways whenever I restart. However, they only seem to show up around system utilities like the WiFi drop downs, right-click context menus, and yes, even my terminal. I was just playing around with it some more, and discovered that a x session logout followed by a login seemed to fix the issue, at least temporarily. I am no longer seeing any missing text anywhere. I'll keep trying to see if I can reproduce it reliably. logging out and logging in again fixes the issue.. But it keeps coming up sometimes..
Logging out and logging in will sometimes fix the issue for me, but only temporarily. More info, changing fonts in a particular application will generally cause the letters to be rendered correctly. Changing back (in the same session) will show the missing letters again. 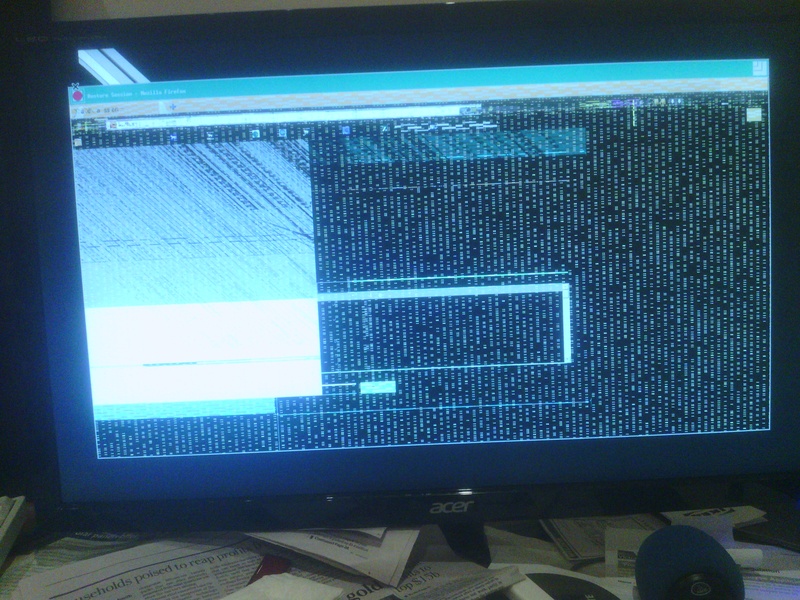 This happens on all of Ubuntu 14.04, Ubuntu 14.10, Kubuntu 14.10 on a Thinkpad T450s. (It is least problematic on Kubuntu 14.10). Hope this extra bit of info helps. Has anyone tried the Intel graphics installer that seth mentioned in his original post? 1.0.8 will not work on 14.04. I tried it on 14.10 and it complained and woudn't load. I had 1.0.8 installed on Ubuntu 14.04 before it was made impossible (because of potential problem with backported graphic stack on 14.04.2). 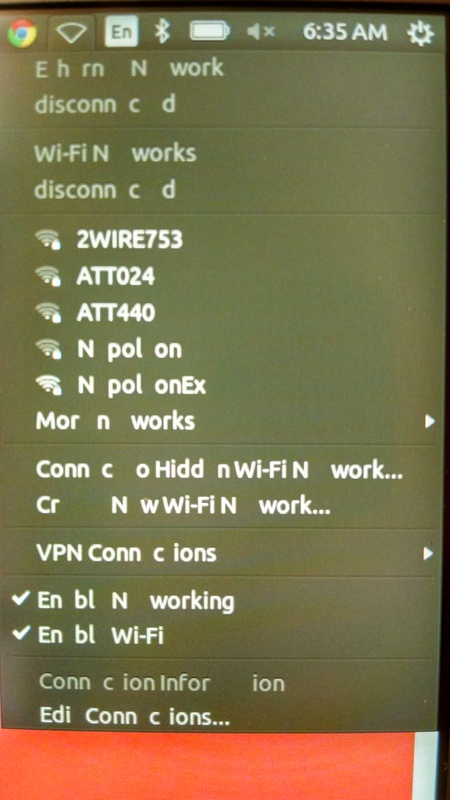 Anyway it was well installed and the missing letter bug was also present. Note that Intel driver is not annonced as compatible for HD graphic 5500.
has anyone experienced this bug on Gnome or Xfce? Judging by the bug attachments, it looks like Unity and LXDE are confirmed so far. I see similar to this on a Dell E7450. Sad but seems to work solution: disabling SNA for old XUA method (as described here: https://wiki.archlinux.org/index.php/Intel_graphics#SNA_issues). I was going to try out John's suggestion, but it seems that I don't have xf86-video-intel installed on my system. So, should I try and install it (and if I do, can I remove it easily?) and if I install it, should i take the suggestion above? As per the comment from "John doe", switching the intel X11 driver AccelMethod to uxa fixed the problem for me. Is the workaround much of a performance drop? In any case, it's good there is at least a workaround. Noticeably slower than sna when alt-tab'ing between applications. But better than corrupted text and/or graphics. Since I don't have xf86-video-intel installed, is there a way to disable sna on what I am using? Should I switch? I am attaching my xorg.log. I can confirm that the fix from comment #28 works for me. Don't notice any difference in performance but don't do anything that would require any noticeable graphics performance. For example, at startup, the only icon folder on my desktop is now displayed slowly with UXA rather than SNA. However as Luke #32 said before this is better to have this workaround than missing letters problem, but it's only a workaround, not a real solution. Then reboot and voila. If something goes wrong (if X server failed for example), you just have to delete the 20-intel.conf to revert back. I am running Ubuntu GNOME with kernel 4.0.0-040000rc7 on a T450s. I could solve the issue of missing letters by changing font hinting to medium or slight in the gnome-tweak-tool. But I am still experiencing rendering issues sometimes. Will try out the fix. Do you mean that by modify font size the missing letter prb is permanently solve or were you modify the font when the prb occurs to temporary resolve it? As the problem seems to be a mixtape between kernel, Intel Driver, glib2, etc. I was hoping it may be solve using kernel 4.0 so thanks to have reported that it's not the case. I'm still seeing issues on 14.04. Use sna in the X11 conf. Run for a while and you'll see characters start disappearing and title bars corrupted. Opening google earth seems to make things go bad pretty quick. uxa is still a work around. But sna is markedly faster, so I'd still love to be able to use that. I am also getting this problem on a Dell Latitude E7250 - also with i7 5600 + Intel 5500 video, using Ubuntu 14.04.2 - the corrupt text is making software development very hit and miss... a fix would be GREAT! I also use i915.enable_execlists=0 as a kernel parameter and it appears to be stable now. I tried to follow the instructions given in post 100 and got he error: breaks existing package n 'intel-gpu-tools' that conflict: 'xserver-xorg-video-intel'. My computer is a dell latitude E7450 and i have Ubuntu 14.04. Any idea how to solve this problem? I would very much appreciate your help! I am running Ubuntu 14.04 on a Thinkpad X250. 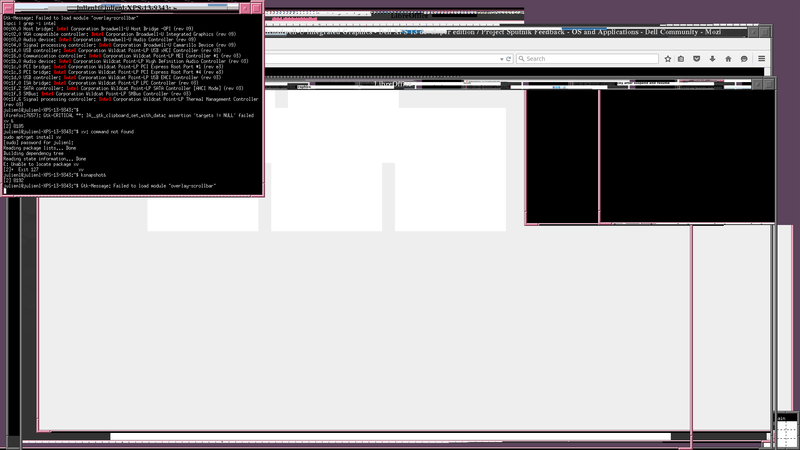 I still have this issue (corrupted fonts, flacky graphics interface) running the latest kernel. Besides, I have the exact same problem reported in post 130 when trying to apply the fix in post 100. The problem is exacerbated when using an external monitor, which in my case is 90% of the time. I also confirm that running google maps essentially corrupts everything (I have to reboot), although the LITE version works. Accepted into utopic-proposed. The package will build now and be available in a few hours in the -proposed repository. 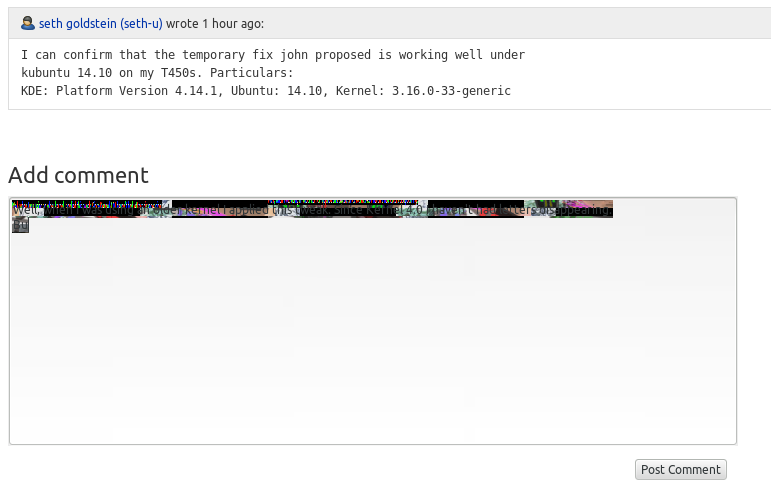 Accepted xserver-xorg-video-intel-lts-utopic into trusty-proposed. The package will build now and be available at https://launchpad.net/ubuntu/+source/xserver-xorg-video-intel-lts-utopic/2:2.99.914-1~exp1ubuntu4.5~trusty1 in a few hours, and then in the -proposed repository. but I'm running Ubuntu 15.04 (vivid). Will this fix be available in vivid repositories too? I have upgraded from the trusty-proposed repository on a Thinkpad X250 and after testing it for a day, it seems to fix the problem for me. No font corruption anymore, even google maps seems to work. Comment: Might be related or not, but yesterday after the upgrade the minimize/maximize/switch off buttons were gone in the non-maximized windows in the external monitor, today they are back. Go figure. 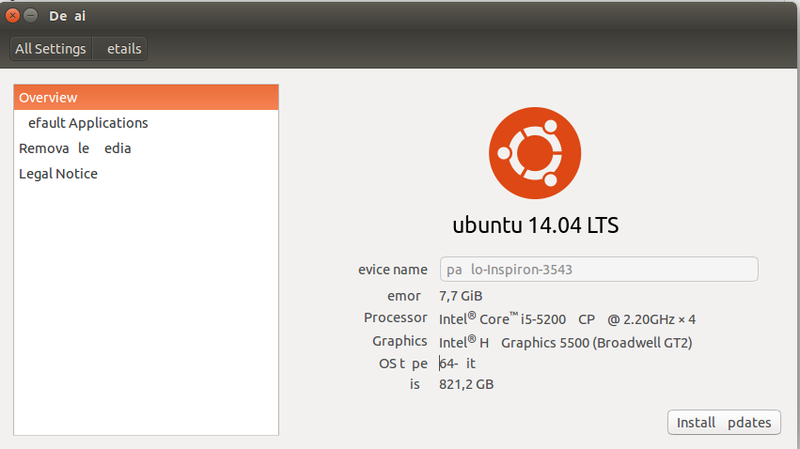 I think I fixed my vivid system by downgrading 2:2.99.917~exp1ubuntu2.2 to 2:2.99.917~exp1ubuntu2build1. 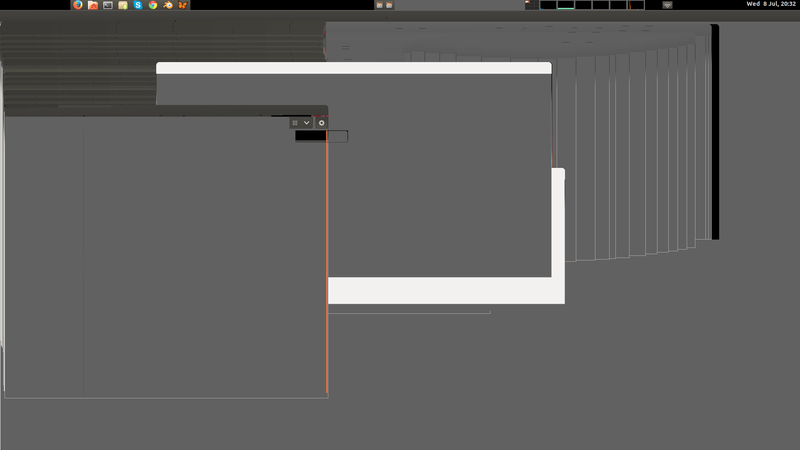 I also tried exp1ubuntu3 and it didn't work. Works great with proposed package. We cannot sell those broadwell laptops and desktops because of this bug right now. We can we expect the fix to be in main ? Since then, resume after suspend does not work well and the windows are not drawn properly (the same as bug #1452318 https://bugs.launchpad.net/ubuntu/+source/xserver-xorg-video-intel/+bug/1452318 ). I post here because the bugs seems to be related. I tried the proposed 2:2.99.914-1~exp1ubuntu4.5~trusty1 , but the resume after suspend problem persists. The only workaround for the moment is to switch the SNA to UXA as commented in #28, but a lack of performance is noticable as happen to #111. By the way, I can confirm that the missing letters problem is solved with the proposed 2:2.99.914-1~exp1ubuntu4.5~trusty1 . * Backport utopic package for lts-utopic stack. The issue is not fixed for vivid (15.04). What is the status on this? Here is what I see. I use FVWM and the results are even worse. This occurs every time I suspend and resume into fvwm. If I log out of FVWM and log back in, the glitches go away. @Julien, this bug is about the missing letters. 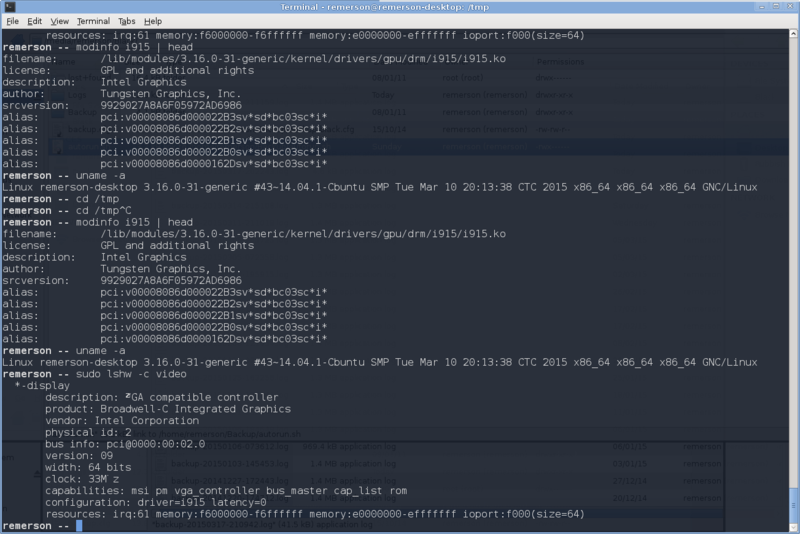 The resume after suspend bug seems to be related as well with the xorg-video-intel, and is filed as the bug #1452318 . So please, go there and include yourself in the list of affected users. I can report issue is NOT fixed with 2:2.99.914-1~exp1ubuntu4.5~trusty1 Using Lenovo X1 Carbon 3rd Gen - just got corrupted UI menus after suspend-resume. Should be reopened. Adding to my above report - after the update to 2:2.99.914-1~exp1ubuntu4.5~trusty1 screen started to go blank(black) constantly. In intervals from seconds to minutes. System is till running OK, I am able to start the screen by Ctrl-Alt-F1 and then Ctrl-Alt-F7. I do not know if this is really connected to driver. Zlatko, as said before, the resume after suspend bug seems to be related with the xorg-video-intel, and is filed as the bug #1452318 . So please, go there and include yourself in the list of affected users. Report there your bug. It did upgrade the driver. However, I still see the issue with my graphics in FVWM. I've got exactly this issue (missing characters, sometimes funny colored artifacts replacing characters in fonts) on the Lenovo T410s (Ubuntu 15.04, xserver-xorg-video-intel 2:2.99.917-1~exp1ubuntu2.2). Will this fix be ported to Vivid? I don't really see a fix in all of the notes. I see a 'workaround', but it isn't a very good option, as it affects performance. 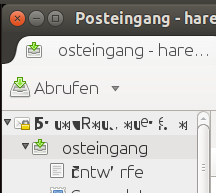 Modifying anti-aliasing improves with Ubuntu Tweak, but only disappears leaving the session. Reappears random. It also affects all of the HP Streams my family uses. They are currently running Ubuntu 15.10. Displaying first 40 and last 40 comments. View all 166 comments or add a comment.